Move over, Gus Hansen. Get out of the way, Carlos Mortensen. You've now got company in the three-time World Poker Tour champion club. Two weeks ago, Anthony Zinno appeared on Episode 269 of the PokerNews Podcast. During the interview, which came following his second WPT title, he was asked what it felt like to have earned a similar achievement as some of the game's greats. Zinno responded, "Wow, you know just hearing you ask that question sort of gives me chills." He then went on to say, "I don't quite categorize myself by any means in the same pool as [Daniel] Negreanu and [Phil] Hellmuth because of how much they have done for this game." Well, maybe it's time Mr. Zinno stopped selling himself short because he is now just one of three players to capture three WPT titles and win back-to-back WPT events. Zinno entered the final table of the 2015 WPT L.A. Poker Classic Main Event fifth in chips, and just six competitors remained from the field of 538. Not much happened for Zinno through the first several orbits around the table, but he was able to ladder up at least one spot thanks to the elimination of Peter Tran in sixth place on Hand #31 of action. Then on Hand #56, things started to swing in Zinno's favor. According to the live coverage, Zinno was all in for 955,000 with the against the for Peter Neff with the blinds at 30,000/60,000 with a 10,000 ante. The flop, turn, and river ran out , and Zinno doubled to just over 2 million. Neff, who was left with under 10 big blinds, found himself all in on the next hand with the to Zinno's . Despite being in a dominating spot to double up, the eliminated Neff. The next couple of orbits saw Zinno slide back a bit, but then he doubled on Hand #97 before moving into the chip lead on Hand #100, both times through Mike Leah. Leah wasn't done yet, though, as he moved back in front shortly thereafter and didn't look like he wanted to slow down one bit. On Hand #128, Zinno took a hit when Chris Klodnicki found a double though him, and that put Zinno back on the short stack. But then, Hand #140, #142, and #143 happened in quick succession that all favored Zinno. First, he doubled up through Leah again. Then, hit a pay jump when start-of-the-day chip leader Igor Yaroshevskyy fell in fourth place. And finally, he doubled through Leah for a third time. On Hand #154, Zinno found a fourth double through Leah, and this put him back in front. It happened when Zinno's held against the for Leah. From that point on, Zinno pressed his opponents to gain more chips, busted Klodnicki in third place on Hand #161, and entered heads-up play with 11.5 million in chips to Leah's 4.625 million. Zinno and Leah exchanged jabs with the blinds at 75,000/150,000 and a 25,000 ante, but no big haymakers were landed until Hand #173 when it all came to a close. The level had just increased to 100,000/200,000 with a 25,000 ante, and Leah had the button to start. He min-raised to 400,000, Zinno reraised to 825,000, and then Leah shoved for 3.95 million. Zinno quickly called with the to have Leah's absolutely crushed. The flop did give Leah a gutter, but the turn card and river card couldn't do it for him, and with that Zinno had landed his third WPT title. Leah earned an impressive $701,350 for his finish, but this night was all about Zinno. 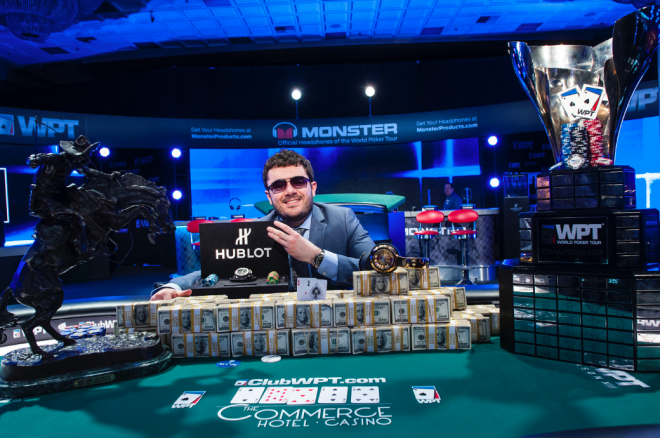 Not only did he score his third WPT title and become the third player in history to win back-to-back events, but Zinno pocketed a massive payday of $1.015 million. Furthermore, Zinno really helped to distance himself from the pack for the WPT Season XIII Player of the Year award. Back to the PokerNews Podcast that Zinno was on, he was asked about the Player of the Year race, to which he said, "So in order to get more points, I'm pretty much going to have to top 27 something in Cali." As it turns out, he did more than just make the top 27. He won the entire thing. *Photo and data courtesy of the WPT.